In the early 90s Public Enemy were at the top of their game and along with NWA were leading a charge of bicoastal hip-hop that was conscious, raw, powerful and aggressive. Striking while the iron was blazing, Public Enemy DJ Terminator X released his solo debut that featured samples from Black Flag and guests like Chuck D, Sister Souljah. 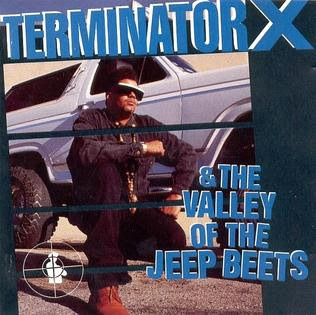 In 1991, Terminator X and the Bomb Squad produced the 47-minute Terminator X and the Valley of the Jeep Beats. The album, full of break beats, instrumentals, early drum and bass, was something for every car in every city and suburb to blast while driving down the highway. Producing two successful singles, "Homie Don't Play Dat," which went to No. 1 and "Buck Whylin," the debut from the DJ was simply the perfect hip-hop record for the summer when it arrived in May of that year. As young hip-hop seems to be looking for wisdom from the founding fathers of the genre as each new era begins, here is a hidden gem to relisten and learn from.